For 2020 both high school and college baseball will require a NOCSAE certified chest protector. Every chest protector made before 2018 does NOT have the certification. Most chest protectors sold so far in 2018, with exceptions of some All-Star, Under Armour and Wilson, do NOT have the certification. (See some certified options here and here and here). Most manufacturers are pushing to release (Easton, Demarini, etc.) later this year or in 2019. Little League/Youth Ball: For those in baseball below the high school level there is no pending requirement for NOCSEA certified chest protectors. (Our gut feeling is that will change at some point). NFHS and NCAA baseball have explicitly stated the reason for the requirement is for safety and to avoid Commotio Cordis (impact related heart attacks—which you can read more about below). At the time of this writing, the above represents the NOCSEA certified protectors we could find. It might not be exhaustive. We do not intend to update this as time goes on. Consider this a starting point for your search. Above are All-Star catcher chest protectors that have the new NOSCAE certification. Do current chest prospectors NOT work? We did not find, via google search, any instances where a baseball catcher suffered from Commotio Cordis. Baseball impact related heart attacks in the news (as far as we could tell) occurred during fielding, batting or playing catch in the front yard. However, in Lacrosse, for example, goalies are the most common position for the tragedy. Considering not all events get as much press as others it is hard to tell if a catcher with an old chest protector has been giving a heart attack by a baseball where a certified one would have worked. It would appear the risk to Commitio Cordis in baseball is more likely on those with no protection at all. Meaning, those playing in the field or those batting and getting hit in the chest with a pitch. Although they do not have the NOCSAE certification (as of yet) the above type of heart protector is intended to protect the chest area of a player. They make no claim, and neither do we, about its effectiveness towards stopping Commotio Cordis. 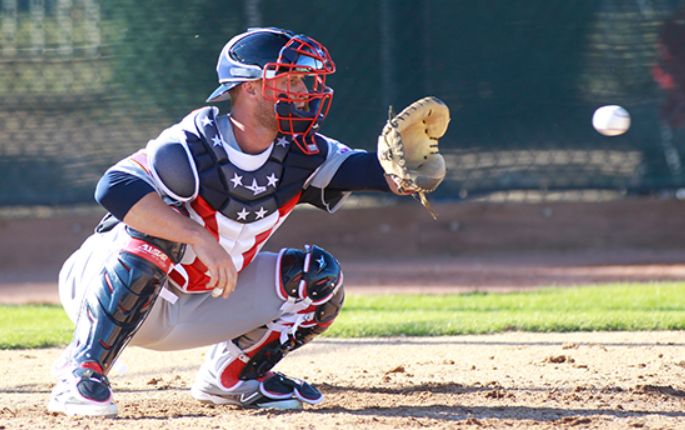 Does that mean the new NOCSAE certification on catcher’s chest protection is useless? If NOCSAE certified chest protectors save a single life, or youth heart attack, then it is irresponsible to claim the certification is useless—even considering this new standard churns thousands of old chest protectors out of the market and creates a windfall of profit to manufacturers. Getting a chest protector to perform to a certain standard seems reasonable. We think the certification is useful (not so much like the USA Bats requirement). But let’s not let the business of amateur baseball of the hook entirely…. Our recommendation, if you are under in the 11th grade or younger in high school, is to buy one with the certification NOW. Although not required in sub-high school baseball (yet) there are already youth sizes available (here). As well, we’d bet Little League ,et. al. isn’t far away on this requirement. (We have absolutely zero inside information here—just a hunch). Tell everyone about the new certification so they don’t make the same mistake. Granted, a 9 year old catcher will very likely be way too big for his or her chest protector come whenever youth ball gets around to enforcing the standard. As such, you might get away with it as you’ll need a bigger one by that time anyways. But, those real close to high school ball would do well to avoid non NOCSAE certified chest guards. Come January 1st of 2020 (all of 15 months from this writing) your chest protector will be illegal. A baseball hitting someone’s chest can disrupt the rhythm of the heart and cause a sort of heart attack in a perfectly healthy individual. Although rare, such an event, called Commotio Cordis, is deadly. In fact, it is the number one cause of death in youth baseball (a relatively safe sport). Player’s under the age of 14 are more susceptible. This year (2018) one 8 year old in California fell unconscious after a neighbor was trying to hit pop flies and ended up hitting a line drive into his chest. Some are luckier. One boy in 2013 was hit by a pitch in chest, fainted no the way to 1st base, and ended up living because two paramedics were watching the game and responded remarkably fast. In short, surviving Commotio Cordis is almost unheard of without a very quick response. In many cases even a very quick response will not save their life either. You would do well to speak with your local EMT and league directors to develop a protocol in place for a very quick response. Consider adding a defibrillator to your field house. Although highly unlikely you’ll ever witness the event it is still useful to know what to do. For several minutes afterwards, pay very close attention to any player when they take a direct blow to the chest. The blow does not need to be done with a baseball. Another player or baseball bat would could cause it too. Also, this applies to other sports. In lacrosse it is more common. But soccer, cricket, football or any number of flying objects into the chest could cause enough impact to disrupt the rhythm of the heart. In the event the player struck in the chest faints, or is about to faint, call 911 immediately. A defibrillator on the scene as fast as possible will be life saving. Although CPR, from what we’ve read, is not terribly effective for a heart attack brought on by Commotio Cordis, it is likely your best bet while you wait for the paramedics (assuming you don’t have a defibrillator handy). If you are interested in some other ideas without a defibrillator you might like this article. Commotio Cordis is deadly. Response time is vitally important.